The Royal Program is presented in luxurious, refined, exclusive packaging with pure, elegant lines to underscore the unique combination of Royal Jelly and gold. 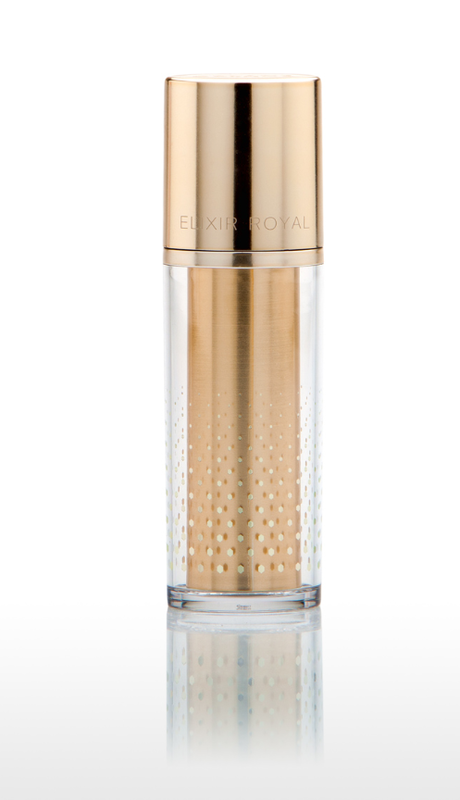 ELIXIR ROYAL comes in a 30 mL airless bottle. It is transparent and adorned with hints of gold to imitate the ridges of a beehive (a drop of metallic gold suspended in a clear package decorated with stylized ridges). Blending elegance and technology, this double wall symbolizes the protection offered by precious Royal Jelly. A rich, silky serum that soaks in quickly to leave a soft, comfortable finish. A complete formula that contains fresh Royal Jelly, a renewing anti-aging ingredient; 24-karat gold, an energizing anti-aging ingredient; and Stargazer Lily, an agent that reduces the size and pigmentation of brown spots. Self-evaluation tests on 30 women. For 100% of women, the skin was moisturized. For 100%, the skin was supple and toned. For 85%, lines and wrinkles were less visible. For 57%, the brown spots became lighter. There was an increase in skin brightness of 17%, as well as a decrease in brown color. a 37% improvement in skin evenness.